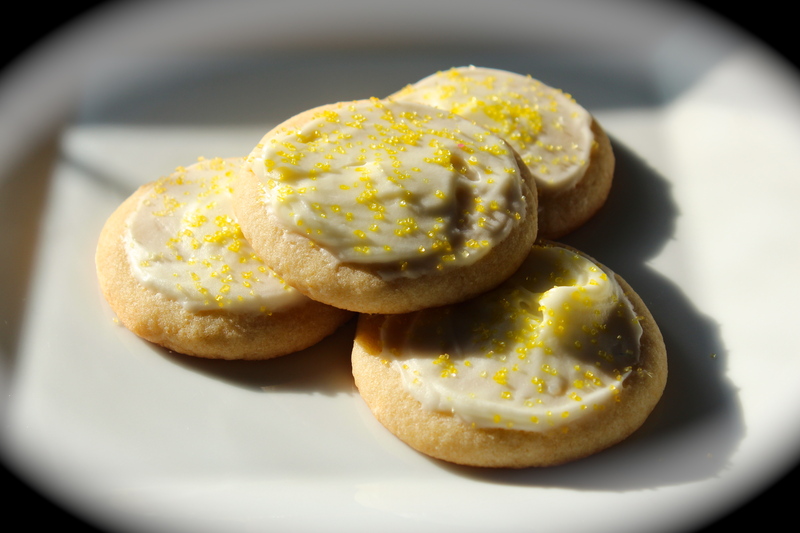 Happiness Project Recipe #24: Lemon Cream Sugar Cookies! Since Lemon just happens to be my 2nd favorite dessert flavor, I knew that I just HAD to create a new Lemon recipe for my family’s 2012 Christmas gathering! Particularly since my Mom was the very person who first turned me on to this lovely, citrus filled delight many a year ago. So casting aside my usual chocolate drenched ambitions, I finally tried my hand at a new sugar cookie recipe. One in which I joyfully incorporated my all time favorite indulgence: frosting! Although the 1st trial run with a classic buttercream frosting turned out quite well, the superior frosting snob that I am simply could not settle for anything less than absolute perfection. Hence this now pleasantly altered buttercream recipe, featuring cream cheese as it’s star flavor! The result? Sugar cookie perfection. At least I think so. In a large mixing bowl on a stand mixer, cream the butter, crisco and sugar until light and fluffy (2-3 minutes on medium speed). Mix in the vanilla, egg and lemon zest. In another bowl, sift together the flour, salt and baking soda. Add the dry ingredients into the wet mixture until just incorporated. Stir in the milk & lemon juice until well combined. With a small cookie scoop, roll your dough into 1 to 1-1/2 inch balls, placing them on a Silpat lined or lightly sprayed cookie sheet. Using either your fingers-tips or a spatula, gently press each dough ball flat. Bake for 10-12 minutes until the edges begin to brown ever so slightly. Remove from the oven and cool on a wire rack. Onward to the frosting! In a large mixing bowl, on a stand mixer, beat the butter and cream cheese together until smooth and glossy. Slowly beat in the vanilla extract. Add in the confections sugar and salt until well combined. Last but not least, stir in up to 2 tablespoons of the lemon juice. « Happiness Project Recipe #23: Cookies & Cream Cheesecake!